Indulge your senses with an exclusive getaway to Casa GiGi, Playa del Carmen. Whether you are enjoying the lush gardens, the amazing pool with swim-up bar or admiring the sunset views from the top of the watchtower, this beautiful castle-esque villa will make you and the entire family feel like royalty in the Caribbean. Built 6 years ago, Casa GiGi stands out in the Riviera Maya due to its unique architecture. 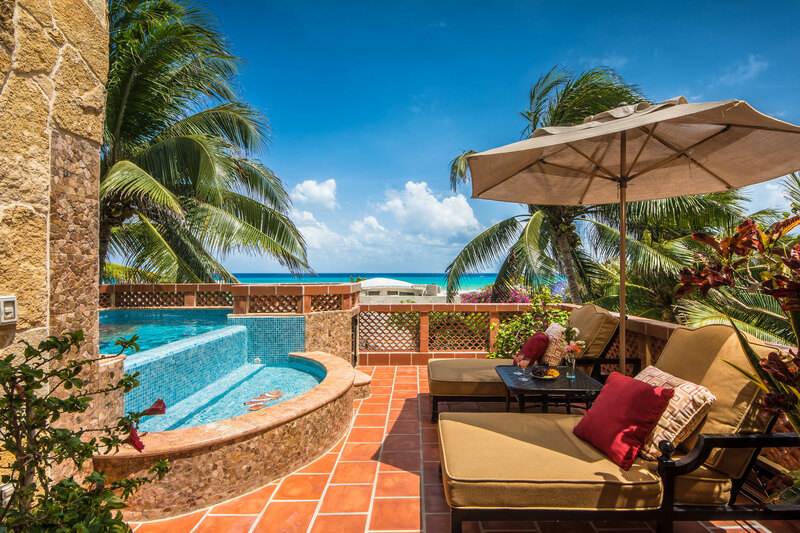 Enjoy breakfast in the shade of the courtyard, surrounded by plants and flowers, or waking up to the Caribbean sea views from the royal king bed in the master bedroom. Show your competitive side with a game of shuffleboard or just sit back and relax in the 1st floor plunge pool, overlooking white sandy beaches and shallow turquoise water. The villa offers 4 ensuite bedrooms in total, with three sharing the stunning views across the sea. Both second-floor bedrooms offer private terraces, a perfect spot to soak up the sun while sipping on tropical cocktails. Downstairs you will find a fully equipped kitchen, best applied by the private Maya Luxe chef service, to create delicious meals throughout the day. The bustling courtyard provides the centerpiece of the house while the watchtower makes for an experience like no other within Playa del Carmen. Make sure to head up there as the sun sets and the sky turns a magical pink. Located in the exclusive gated community of Playacar Phase 1, Casa GiGi is a pleasant stroll from the buoyant Quinta Avenida, known for its charming restaurants, trendy bars and diverse range of shops. You will also find plenty of activities in the neighborhood, like enjoying a rally of tennis overlooking the Mayan ruins or learning to kite surf on the distinguished Playacar beach. However you desire to spend your time at Casa GiGi, one thing is for sure… You will feel like royalty.